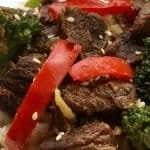 This tasty beef broccoli recipe can be pulled together quickly for a fast and easy weeknight meal. To avoid mushy vegetables, don’t add them until 15 to 20 minutes before this dish done the cooking. The frozen broccoli does not need defrosting before cooking, so feel free to add them directly from the bag into your slow cooker. Actual cooking times will vary by individual unit, so be sure to observe the first time you prepare this recipe to achieve desired results.